This entry was posted on 10/06/2018, 9:14 pm and is filed under How Things Work, Politics. You can follow any responses to this entry through RSS 2.0. You can skip to the end and leave a response. Pinging is currently not allowed. A country based on wordism is a dictatorship. We haven’t discussed whether adding Bob’s “wordism” into our swarm mix at least sometimes is a good idea or not. It seems to me it is, although I was very dubious at first that there was any good way to do it. Another tweet that can be retweeted — THIS ONE IS A GOOD SHORT EXPLANATION OF WORDISM! The tweet is a paragraph from the article that was shortened slightly. Now that I’ve been positive for awhile, I’m returning to the earlier skepticism of my long comment that I deleted. Wordism seems too advanced to me to likely be useful swarming. This tweet that I was so enchanted with for awhile would only be effective, I think, on a person who has already been feeling some sense of racial identity. To others, it reads like an open appeal to feel racial identity, which doesn’t seem useful. A well written article I have reread several times. It is thick with proWhite content and explains Wordism as best as Wordism can be explained. It is certainly material that must be thought about and contemplated before being used, since it goes against the grain of how we have been brought up to see and think about life in general. 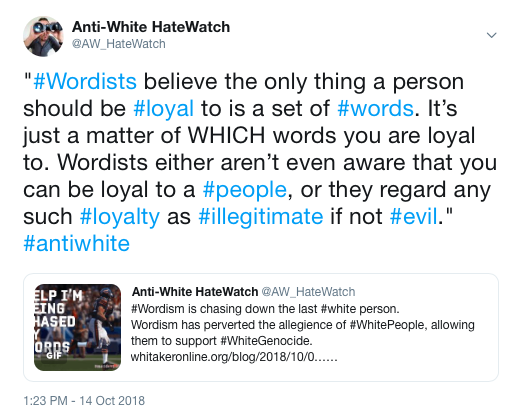 This article along with the excellent Christina Cliff interview (brought up by both Wuntz and eyeslevel) will help all who are fighting against White Genocide and by extension Wordism …but the concepts when used and I mean used beyond the superficial will rattle your brain initially. 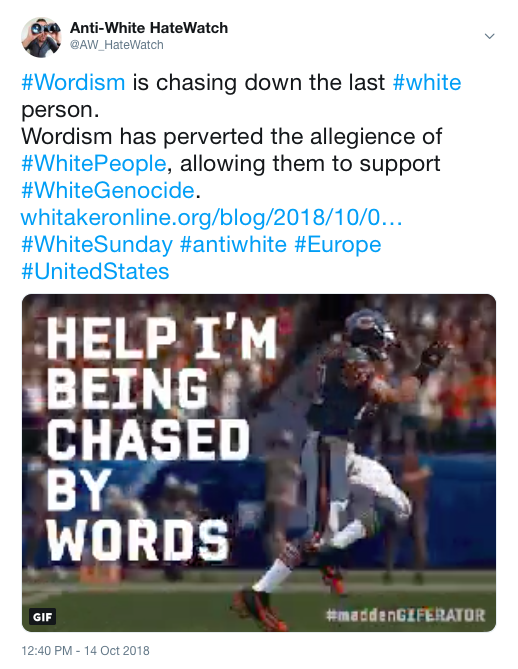 To hopefully succeed in spreading the article, when we link it or post it on other BUGS sites, I’m thinking the title below would add pizazz in addition to including our own fundamental concern of White Genocide. Any opinions? Eyeslevel will have his of course. Also, that title presents Wordism as something that’s already being discussed (the present title does too, but IMO not as much), which will hopefully send all the I-have-to-stay-in-the-know types scurrying to learn more (hopefully they won’t see this comment). 1.Wordists claim to be above provincialism, You can point out that, since there are thousands of Universal Truths, they are at least as provincial as nationalists. 2. Wordists claim to be for peace. You can point out that they have far more blood on their hands than nationalists. 3. You worry about what we might do to maintain an ethnostate. What about what you do to maintain your wordist state? 4. We’re obsessed with purity of blood? You’re obsessed with purity of thought. If there were earlier suggestions from Bob or others about how we might incorporate wordism into our armory, this thread would be a good place to post or link them. I’ve tried to post to (sysop) but the response did not go through.